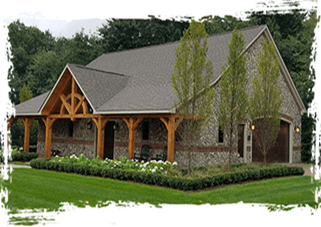 Old Country Stone, in Chesterfield, Michigan has completed masonry and stone projects for many home owners and builders in the upper and lower peninsulas over the last 15 years. General manager Jeff Sykes has over 15 years of experience in design and construction of stone projects. At Old Country Stone we use high quality all natural stone products; while still remaining competitively priced. There are over 100 natural stone products to choose from, or you can add a personal touch on your project by creating a custom blend. The possibilities are endless. We offer a multitude of interior fireplace designs. Some customers prefer the more traditional designs, while others may choose to use their inventiveness to create a design of their own. 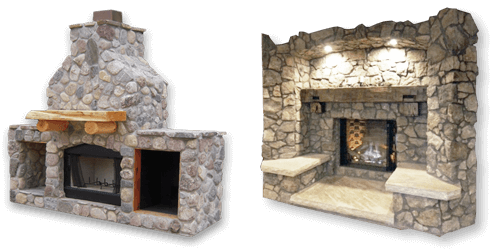 Incorporate a nice homey feel outside of your home with one of Old Country Stone’s countless exterior fireplace designs. Use your favorite natural stone to personify your design. Perfect for enjoying a relaxing summer night with an inviting feel by a fire. Looking to add some elegance to your yard? We specialize in flagstone patios. All of our flagstone patios are concrete based with a natural flagstone overlay. We have an abundance of flagstone colors to choose from. Need to add an exclusive touch on a project? Old Country Stone offers innumerable engraving options to suit all of your needs. 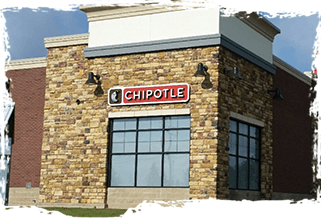 A few of the selections include address stones, personalized custom designs, or larger projects; such as subdivision entrance signs.